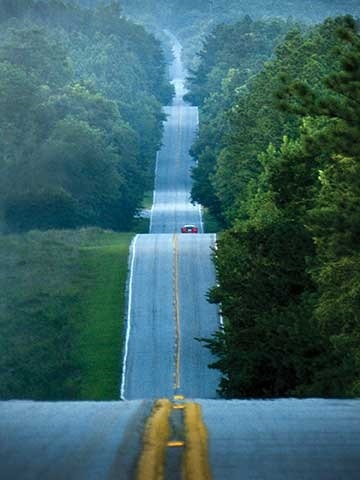 Imagine 2,000 evocative images, generated from numerous road trips along miles and miles of South Carolina highways and back roads. Mix in half-a-lifetime's worth of friendship and creative collaboration, and you start to get some inkling of what goes into the making of a book like Reflections of South Carolina, Volume 2. When Robert Clark and I first met at South Carolina Wildlife magazine, back in the early '80s, we had no idea we'd eventually team up to do a whole series of books about South Carolina. You could say we were both "outsiders." I'm from Georgia and Robert is from North Carolina, but we've both come to treasure the beauty of our adopted home state. As managing editor, I was mostly assigning feature stories to other writers, but writing my own stories was really all I wanted to do. Knowing of my desire to become a full-time freelancer, Robert said to me one day, "Before you leave, let's drive into the country and look for a subject we both like. We'll do a story on it." We found our story out on U.S. Highway 378, and the resulting article "Tenant Homes: A Testament to Hard Times," (July-August '86) caught the eye of the folks at USC Press. 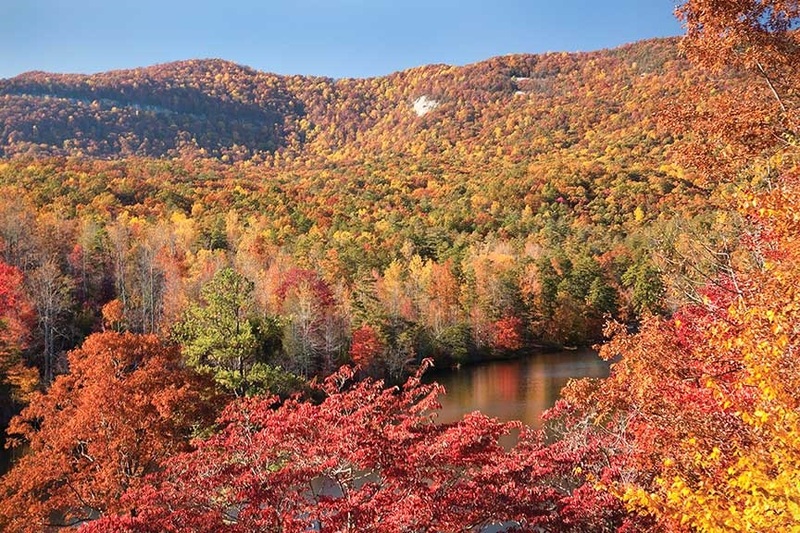 South Carolina, The Natural Heritage, a book about the state's pristine habitats resulted, and, though we didn't know it then, we'd just embarked on a twenty-eight-year odyssey that would lead to four books, the latest being our best, Reflections of South Carolina, Volume 2. Why the best? Since the publication of the original Reflections in 1999, we've grown as artists and accumulated new material. Though we worked three years on the book, the reality is, we've been working on it all our lives. We each have favorite subjects, but providence has favorites too. One time, taking the long way back to Columbia after getting up early to photograph Badwell Cemetery in McCormick County, we drove across a high bridge over Steven's Creek. "Turn around. I see flowers," Robert shouted. 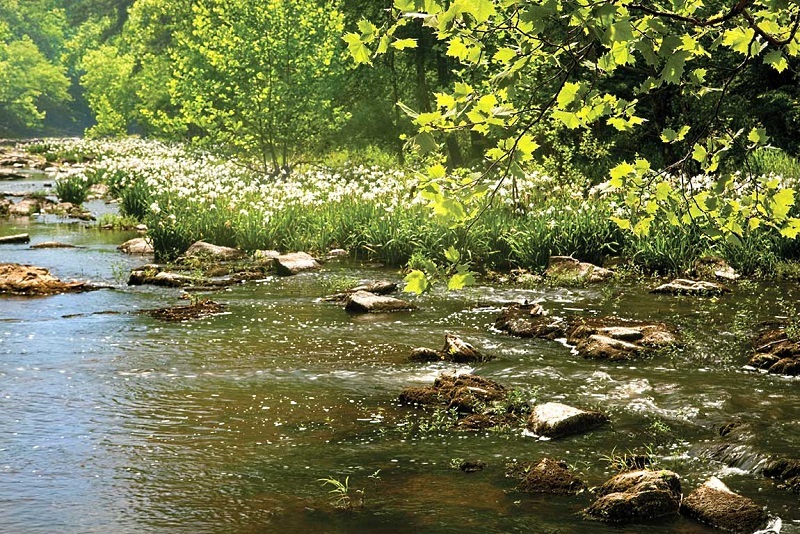 Below, in a sweeping bend of the creek, rocky shoals spider lilies tossed their regal heads about. We had to stop, and climbed a ridge in order to descend a steep bluff down to the creek bank. As I took reference shots, explosions sounded and smoke rolled across the creek. A U.S. Forest Service prescribed burn was underway. Up on the bluff, orange and yellow flames leaped through crackling pine tops, cutting off our escape route. "Robert, the woods are on fire," I said, a little nervously. Of the 2,000-plus photographs taken for Reflections 2, just 250 made it into the book. This feature takes a look at some that didn't quite make the final cut. That doesn't mean they're subpar, far from it! Here, then, are the outtakes, along with a bit of each shot's story. 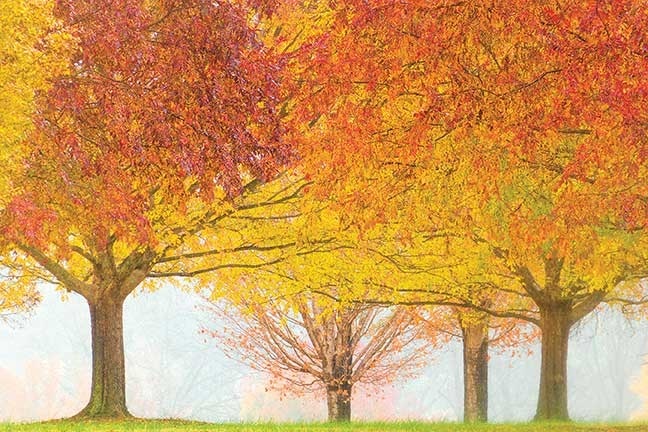 Trees are nature's paintbrushes; dipped into autumn's palette and set upon a ridge, they drip with color. Nature throws one final fling before settling in for winter. As the sun sets earlier and temperatures drop, summer green gives way to shades of red, orange and gold. "Table Rock is a unique spot to photograph a mountain lake," says Robert. "This photo was taken in front of the lodge at Table Rock State Park (see front cover). Geographically, I was on top of a bowl. I don't know of another spot in the state where you can look down on a lake with hills rising up on the other side. With the light coming from behind the distant trees, the photograph gives a sense of distance and appreciation for fall colors. 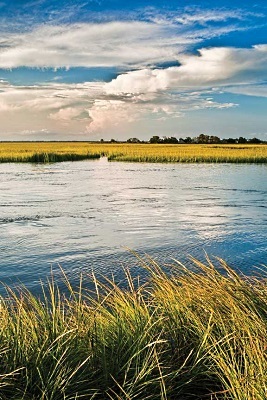 The spartina-fringed waters of this estuary near Hunting Island State Park nurture the sea's delicacies. Throughout the year the colors of the Earth live here; their organic hues speak of an abundance of life for estuaries and their rich detritus anchors the sea's food chain, providing a rich bounty for South Carolina's saltwater sportsmen and women. This natural heritage preserve managed by the S.C. Department of Natural Resources provides a classic example of the Carolina bay phenomenon. Aligned along a northwest-southeast axis, Carolina bays' long axes run parallel, and viewed from flight, these elliptical landforms all point in the same direction. 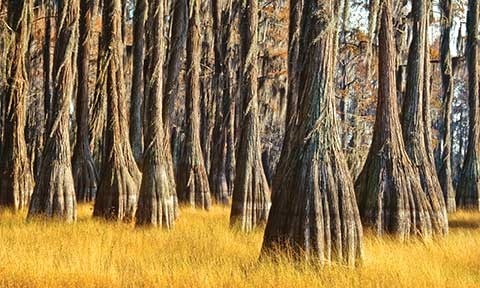 In the dry season, Cathedral Bay's grasses and sedges soften the bay's interior and lie like fleece at the base of buttressed cypress. "This image looks like a simple photo but it was not," says Robert. "About thirty minutes before sunrise I found a great spot and waited for the sun to come up. The fog wasn't planned, but what a great help it was to the photo. I probably wouldn't have gotten a photo I'd have liked without the fog. The fog gave depth to the photo and mood to the river. When the sun broke through the trees like a spotlight, it sealed the deal for a memorable photo. You could say luck played a ninety-percent role in making this photo. I was in the right place at the right time that morning." Though this photograph did not make the final cut for Reflections, Volume 2, the caption did, accompanying an alternate image. Milliken transformed its 650-acre headquarters from a peach orchard into a horticultural center. The Milliken Arboretum earns national accolades as a significant corporate program that encourages knowledge of and appreciation for trees and how they improve the quality of life. 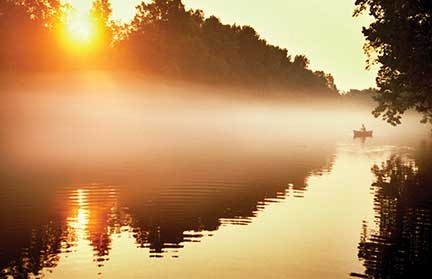 Says Robert about this painting-like shot, "South Carolina happens to be the place I love to photograph most. Each photo needs an element that pleases the reader and I use what the situation gives me. Most of the time it's unique lighting, something unusual or weather. That was the case with this one. As fog smoothed the color in the trees, a steady rain soaked my clothing. I didn't care about getting wet or cold when I saw what my camera was capturing." Cresting, rolling ridges stretch to the horizon like some green-blue sea. 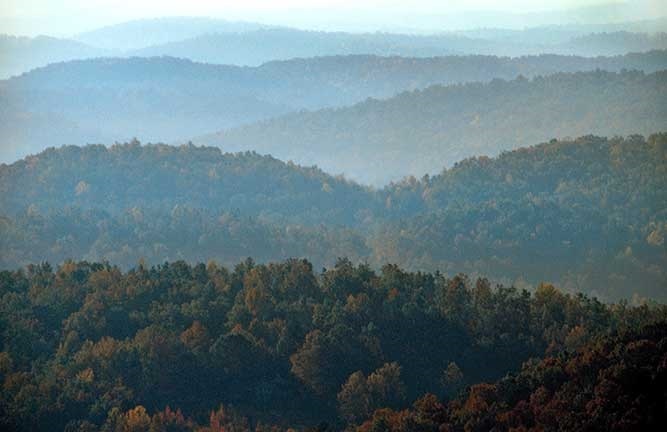 The ridges are blue due to the gases trees give off. Many plants produce isoprene, a common odorless organic compound. It's a bit more romantic, and certainly less clinical, to imagine the blue haze comes from campfires. The Edisto sings its river song as it swirls and babbles beneath moss-draped live oaks, bald cypress and water tupelo. 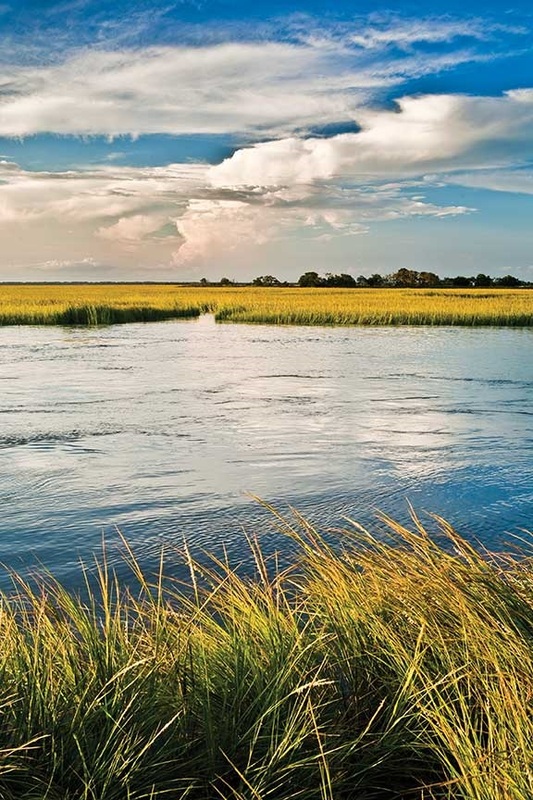 The longest and largest river system within South Carolina, the Edisto's serpentine route graces ten counties. Wandering 206 miles from underground springs in Saluda and Edgefield counties to the Atlantic Ocean at Edisto Beach, it's also America's longest free-running blackwater river. When it was built in 1876, this, the third lighthouse on this site, stood on solid ground, 1,200 feet from the sea. 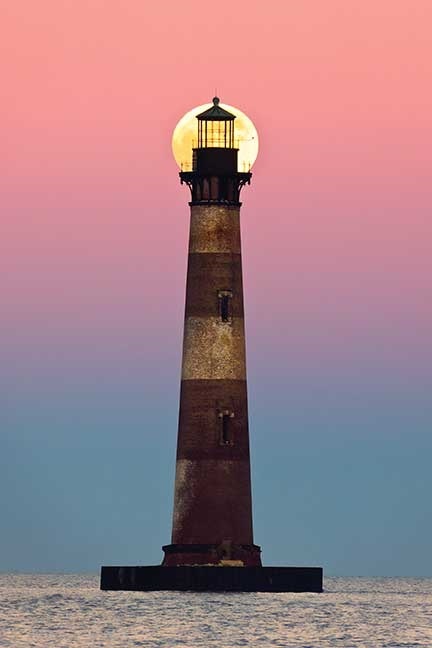 Jetties built in 1889 to protect the shipping lanes of Charleston Harbor altered the currents, rapidly eroding Morris Island, and today the lighthouse stands 300 yards off Folly Beach. 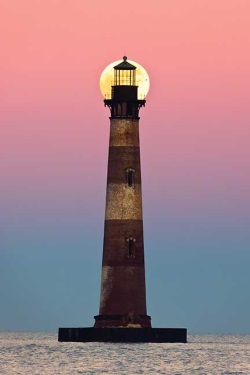 In 1962 the Charleston Lighthouse, located on Sullivan's Island, replaced the decommissioned Morris Island Lighthouse. Save the Light Inc. is a nonprofit organization fighting to save the lighthouse from the sea. U.S. Highway 21 runs straight as an arrow between Ridgeway and Great Falls. In this image taken along this desolate stretch, there are no billboards, just woods and a lonely car bound for Great Falls. Highway 21 was once a major north-south passage. Then Interstate 77 arrived. From its southern terminus at Hunting Island, this ribbon of asphalt runs 233.2 miles to Rock Hill, where it merges with the interstate outside Charlotte, North Carolina. Plantation oaks' gnarled limbs, Spanish moss and resurrection ferns form the elements of a classic Lowcountry vista. This picturesque setting is a time tunnel into the past... dirt roads are fading away. A washboard lane makes a car skitter about and sooner or later potholes will develop. Sufficient reason to lay down asphalt, I suppose, but what beauty we lose. 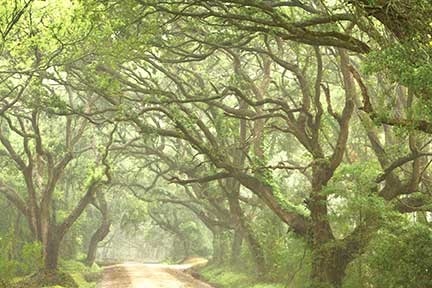 Edisto Island has its share of lovely dirt roads still, and there's poetry in this sandy lane softened by island mists. When a cloud comes up, the first large drops will spatter against the dirt releasing a smell that's the fragrance of life itself. Robert and I decided not to submit this photo for Reflections, Volume 2. Even though we risked life and limb to get it, we'd already covered these beautiful lilies in the first book. Look downstream and you can just see the haze from the prescribed burn that nearly trapped us on the riverbank. Here's what we would've written for the cutline: "Hymenocallis coronaria is native to large streams in South Carolina, Georgia and Alabama. These southern beauties grow where rocky shoals and bedrock outcrops provide solid anchor for the delicate plants. They peak from mid-May to mid-June." 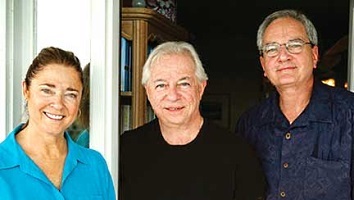 A two-fold mission took us to Sullivan's Island one evening in August: photographing a turtle hatching and getting our group photograph taken with writer Mary Alice Monroe. Mary Alice is the author of nearly two dozen novels, along with several non-fiction titles and children's books. Her body of work reflects her commitment to the natural world through literature. She also penned the foreword for Reflections, Volume 2. A soft summer evening isn't the worst time to liberate baby turtles. For one thing, the sand isn't as hot. For another, evening's darkness increases their chance of evading predators. 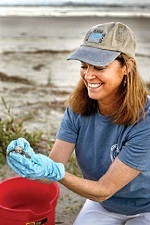 Wearing latex gloves and a blue turtle team T-shirt and cap, Mary Alice carefully dug into the nest. A mix of hatchlings and spent eggs came out slowly. Fourteen hatchlings went into a red bucket. When all were accounted for, all eggs, hatched or not, went back into the nest and were covered. A team member drew two lines in the sand, the lane down which the baby turtles would crawl seaward. The bucket of babies was gently laid over, and out scrambled the latest generation of sea turtles. Down toward the water they went. Despite the helping hands guiding them seaward, the odds aren't good. Just one in every 1,000 of those baby turtles will make it to adulthood. 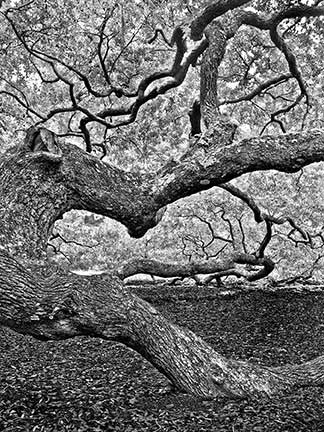 You won't find a Hollywood epic about the South that doesn't show live oaks drenched in Spanish moss, and Charleston's Angel Oak has surely seen its share of Spanish moss, as have Native Americans, explorers, colonists and others who have stood in the great tree's shadow across the centuries and marveled at a plant for which they had no name. The South's image is forever framed by oaks and cypress draped in moss, and Angel Oak is the star of stars. When you set out to create a photo-essay book on an entire state, you travel a lot. During the course of researching and taking photographs for four books, Tom Poland and Robert Clark have driven down many a Carolina road. From the green northwest corner into the Piedmont, through the Pee Dee and Sandhills, and into the Lowcountry, they've traveled thousands of miles and documented South Carolina's gems, both hidden and known. Their most recent trips culminated in a beautiful coffee-table book published by the University of South Carolina Press this past spring. 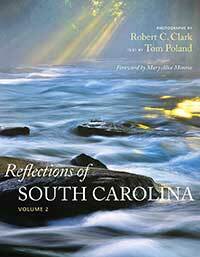 Reflections of South Carolina, Volume 2, showcases the state's beauty, history, geography and culture. 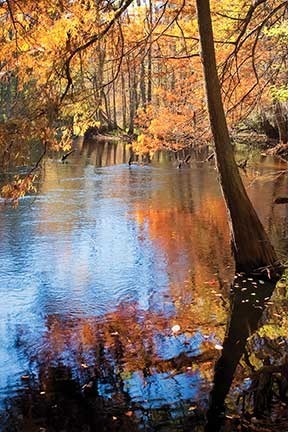 Both USC Press and South Carolina Wildlife have a history of publishing writers with a heart for the great South Carolina outdoors, and we're pleased to be able to offer our subscribers a special deal on Reflections of South Carolina, Volume 2 when you order directly from the publisher. Just call the USC Press toll-free order line at 1-800-768-2500 and place your order with the code SCWMD to receive 10 percent off the retail cover price. Over the course of 2015, we'll be featuring other USC Press authors who love the outdoors (and more great deals)! In our January-February issue, look for an excerpt from Den Latham's Painting the Landscape with Fire. In March-April, it'll be Dana Beach's Deveaux. May-June will feature Archibald Rutledge's classics Claws and The Doom of Ravenswood, with new material by artist Stephen Chesley and authors Jim Casada and Ben McC. Moise. The July-August Sportsman's Calendar issue will offer a sneak peak at the new Jacob F. Rivers III-edited anthology of classic early Southern sporting tales from 1830-1910. September-October will feature H. William Rice's The Lost Woods, and we'll finish out the year in the November-December issue with an excerpt from frequent SCW contributor A. Hunter Smith's new book, Stories from a Life Afield.